Baltimore Police Captain badge for the Northwestern District. Jeweler made with hard fired enamel. According to noted Baltimore historian Bruce Green, the only one known to exist. On September 8th 1868 George Earhart was appointed a Policeman for the Western District. After eighteen months of service as a patrolman a position opened up and he was raised to the rank of Sergeant with night duty. Two months later he was assigned to day duty. 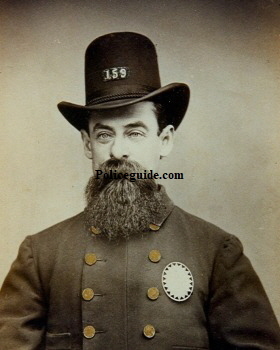 On April 9th 1874 he was promoted to Lieutenant. Six months had scarcely passed by when on October 19th 1874 he was promoted to Captain having reached the rank in six years after his appointment as patrolman. Captain Earhart took a prominent part in suppressing the riots of 1877. He held that position until his retirement in 1889. 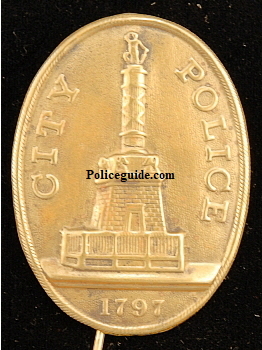 Pre 1st issue oval Baltimore "Regular Police" badge, circa 1845. 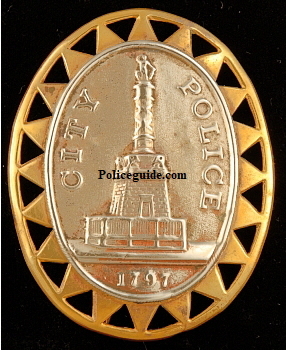 Baltimore Police star badges issued Oct. 20, 1851. 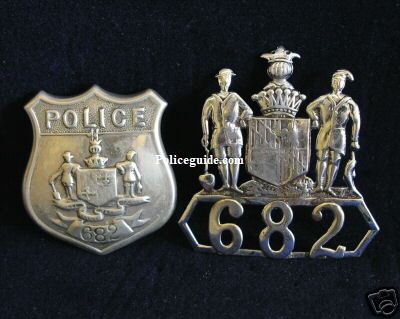 1st style Baltimore Police 3rd issue badge issued June 22, 1862. These badges were made with the 1st issue center seal and are two piece construction with a brass ring and points. 2nd style Baltimore Police 3rd issue badge with a slightly different seal and one piece construction. All white metal. A. E. Warner of Baltimore, one of Baltimore's early and celebrated Silversmiths. The Baltimore police, as constituted in 1848, consisted in the daytime of one high constable, one regular policeman for each ward, who was also Lieutenant of the nigh-watch in his district, and the night watchmen. Besides these there were two extra policemen for each ward, who were called into service as occasion required." 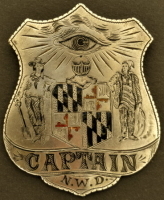 The Stars.--The badge designed to be worn by the city police was yesterday mounted for the first time by Messrs. McKinley & Calloway, who are in special attendance at the hall of the Maryland Institute. It consists of a heavily gilded, brightly burnished six pointed star, in the centre of which is seen a correct representation of the Battle Monument, surrounded by the words "City Police," and underlined with the date of "1797" the date of our city's charter. The star is worn on the left lappel of the coat, and is so conspicuous that he who runs may read. A "Supplement" to this ordinance, which was passed on March 9, 1835, provided for the appointment of twelve lieutenants of the watch, constituted policemen "to preserve the peace, maintain the laws and advance the good government of the city." These lieutenants were required to reside in certain districts by the Mayor and have conspicuous signs on their houses bearing their names and office. 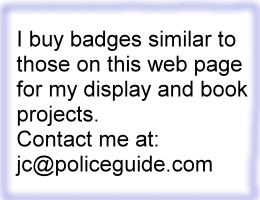 In addition to their police duties, they were required to act as city bailiffs about the markets Page 23. The Baltimore police, as constituted in 1848, consisted in the daytime of one high constable, one regular policeman for each ward, who was also Lieutenant of the nigh-watch in his district, and the night watchmen, Besides these there were two extra policemen for each ward, who were called into service as occasion required. This system of day police was changed from time to time to keep pace with the increase in the number of wards in the city, until the wards numbered twenty. There was, however, no material alteration in the system until 1857, when a complete reorganization took place under the authority of an act of the Legislature passed in 1853. 4th issue Baltimore Police matched set of wreath and badge dating from 1890 - 1915. 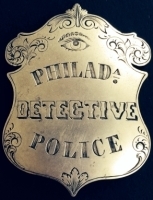 This badge set was assigned to Officer James E. Schmidt of the Northern District. He was appointed in 1894 and served until 1923. In the original leatherette box marked, WELSH & BRO, BALTIMORE, MD. Is this elaborate and truly unique yellow and white gold police suspension badge. It is two inches wide and in the form of a belt and buckle. The wording "DEP, MARSHAL OF POLICE" appears in hard black enamel. The borders are outlined in hard red enamel. The intricate emblem of the Maryland Jockey Club is suspended in the center. The inscription on the reverse of the badge reads, "JACOB FREY - FROM THE MARYLAND JOCKEY CLUB - SPRING MEETING 1882." 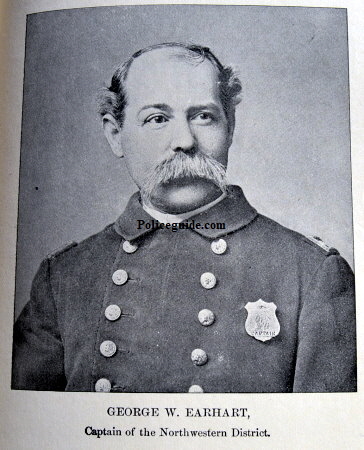 Frey was appointed to the Baltimore Police force with the rank of Captain in 1867 and served for thirty years. He was made DEPUTY MARSHAL in 1870 and MARSHAL in 1885. He served as Marshal (Chief of Police) until 1897. From the Baltimore Sun, June 3, 1882. Presentation to a Worthy Officer - The Maryland Jockey Club has resolved to present Deputy Marshal Jacob Frey with a "shield indicative of his official rank and engraved with the monogram of the club" in recognition of his services in the preservation of order during the various meetings at Pimlico. The Maryland Jockey Club built Pimlico Race Course in Baltimore in 1870. The "Preakness" run here every spring is the middle jewel of the triple crown of thoroughbred horse racing in the United States. From Our Police, published 1888, page 22: By an act of the Legislature in 1812, the Mayor was empowered to appoint, as he found it necessary, not less than twenty-five nor more than one hundred bailiffs to aid in preserving the peace. The Mayor was also directed to prescribe the duties, designate the badges and weapons and provide for the compensation of these bailiffs so as to best secure the objects of their appointment. 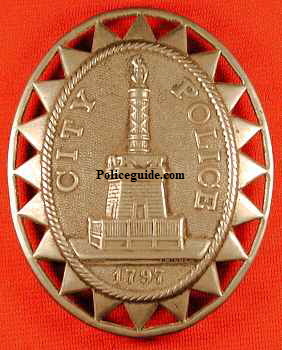 On March 9, 1826, the Mayor was given control of the police of the city by an ordinance which provided that there should be appointed, annually, two captains and two lieutenants of the watch for the Eastern District; two captains and four lieutenants of the watch for the Middle District and two captains and two lieutenants of the watch for the Western District.